Get your hat and boots and get ready to rodeo! For UPRA, the United Professionals Rodeo Association, members of the Hopkins County Rodeo Association are planning their Spring Rodeo. It will be held in two performances; on Friday April 19 and Saturday April 20 in the Hopkins County Regional Civic Center’s indoor arena. Doors and concessions will open at 6pm both nights, and all families in the local area are invited to enjoy all the fanfare and the exciting major rodeo events. And there’s a lot more! Kids can enter the Chuckwagon Races, Boot Scramble and Calf Scramble in the arena. Other local events will include Celebrity Steer Riding, Mutton Bustin and Steer Scramble. Providing the livestock for the rodeo is J and J Contractors, named the 2018 UPRA Contractor of the Year. Rodeo tickets for Friday night are $10 adult and Saturday tickets are $12 adult. Child tickets are $8 each night. Following the Saturday night performance, Jason Waldon and the Alibis will put on a rodeo dance for ticketholders. 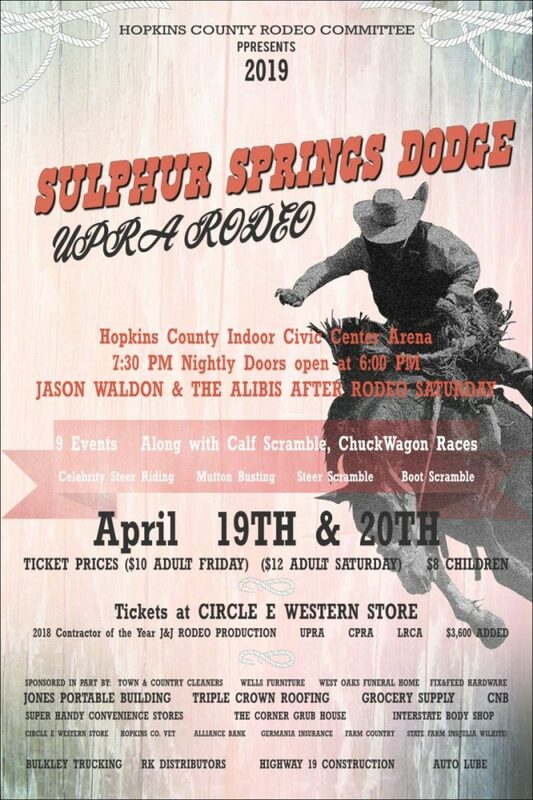 You can purchase tickets in advance at Circle E Western Store, and at the box office on rodeo nights.